Alex Jones: Eugenicists and Their Soft Kill Weapons ! December 28, 2009 Posted by mosesman | Medicine & Health	| Eugenics, Illuminati, New_World_Order, Vaccine | Comments Off on Alex Jones: Eugenicists and Their Soft Kill Weapons ! North Magnetic Pole Is Shifting Rapidly Toward Russia! I am aware that the magnetic pole has been shifting. But nevertheless am rather surprise at its speed. I wonder how this will affect the animal kingdom, particularly birds who navigate south for the winter. Their built-in magnetic compass will be off. Some people are of the opinion that 2012 will usher in magnetic pole reversal and geographic pole shift. This is because the solar system will be aligned to the galactic ecliptic plane and it will exert an enormous gravitational pull. This is not outside the realms of possibility. The earth has had crustal geographic pole shifts in the past before. The bible indicates that during the end times there will be geologic upheavals and quite obviously points to astronomical effects on the earth. Why will the earth ‘move out of her place’? Why will the earth ‘reel to and fro like a drunkard’? Both verses clearly point to large gravitational effects of some large objects or perhaps the galactic plane. Some are of the opinion that the return of Planet X and its satellite moons will cause these. The theory is: the Planet X system is a brown dwarf and has many planets and moons circling it. Strictly speaking an object about the size of Jupiter (the estimated size of the largest planet in the Planet X system) coming near earth’s orbit will cause all the above catastrophes. As its satellite moons move around this large brown dwarf, Planet X system, it will pull the earth one way and then another causing the earth to ‘reel to and fro like a drunkard’. Many are of the opinion that this Planet X system will return in 2012 coinciding with the Mayan prophecies of 21 Dec 2012. I am not so sure. This brown dwarf with a gas giant planet about the size of Jupiter circling it, should be visible soon if it is about to intersect earth’s orbit in 3 years time. Although, I am not a believer in Mayan prophecies, I am particularly impressed with their astronomy and mathematics. Factually, they are correct with their 2012 galactic alignment predictions. Just how they manage to do so is a big mystery. The ancients are not as dumb as what most history books make them out to be. New research shows the pole moving at rapid clip—25 miles (40 kilometers) a year. Over the past century the pole has moved 685 miles (1,100 kilometers) from Arctic Canada toward Siberia, says Joe Stoner, a paleomagnetist at Oregon State University. At its current rate the pole could move to Siberia within the next half-century, Stoner said. “It’s moving really fast,” he said. “We’re seeing something that hasn’t happened for at least 500 years.” Stoner presented his team’s research at the American Geophysical Union’s meeting last week in San Francisco. Lorne McKee, a geomagnetic scientist at Natural Resources Canada, says that Stoner’s data fits his own readings. “The movement of the pole definitely appears to be accelerating,” he said. The shift is likely a normal oscillation of the Earth’s magnetic field, Stoner said, and not the beginning of a flip-flop of the north and south magnetic poles, a phenomenon that last occurred 780,000 years ago. Such reversals have taken place 400 times in the last 330 million years, according to magnetic clues sealed in rocks around the world. Each reversal takes a thousand years or more to complete. The north magnetic pole shifts constantly, in loops up to 80 kilometers (50 miles) wide each day. 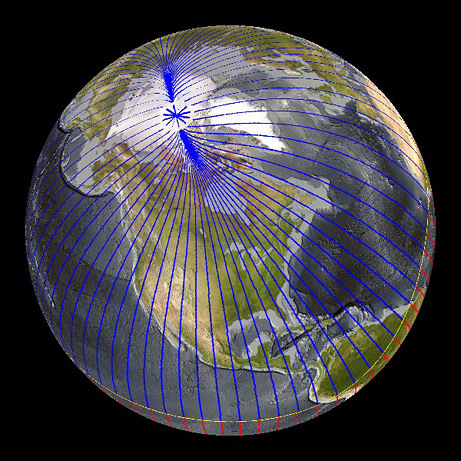 The recorded location of the pole is really an average of its daily treks, which are driven by fluctuations in solar radiation. 11 And there will be great earthquakes in various places, and famines and pestilences; and there will be fearful sights and great signs from heaven. 26 men’s hearts failing them from fear and the expectation of those things which are coming on the earth, for the powers of the heavens will be shaken.